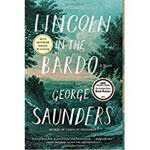 From a seed of historical truth, George Saunders spins an unforgettable story of familial love and loss that breaks free of its realistic, historical framework into a supernatural realm both hilarious and terrifying. Willie Lincoln, the 11-year-old son of Abraham Lincoln, who died leaving a deeply grieve stricken father, finds himself in a strange purgatory where ghosts mingle, gripe, commiserate, quarrel, and enact bizarre acts of penance. Within this transitional state—called, in the Tibetan tradition, the bardo—a monumental struggle erupts over young Willie’s soul.